What is Kefir and why is it good for you? Rather than creamsicles we have Solaros here in the UK – ice cream on a stick coated with a tangy fruit sorbet; refreshing and indulgent at the same time and a hot weather favourite. 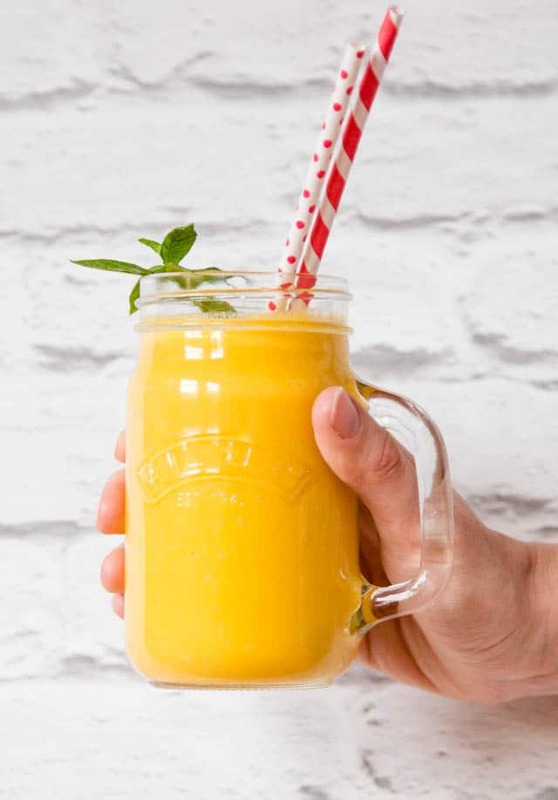 The creamsicle flavours of the tang of the citrus with the creamy vanilla also make a delicious flavour combination for a smoothie. It is also a glorious colour to brighten the dullest of mornings and to transport you to a summer’s day. 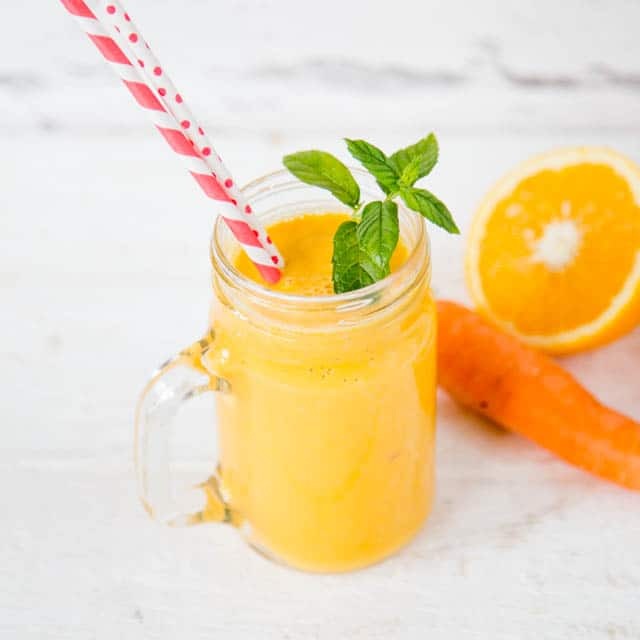 It is also packed with vitamin C, to help ward off winter colds and ‘flu, as well as beta-carotene, which your body converts to Vitamin A and is essential for healthy skin and eyes. I try to keep the amount of fruit in my smoothies to one portion or less, and add at least one portion of vegetables to help reduce the amount of sugar and mean I can enjoy a smoothie without the accompanying sugar hit. 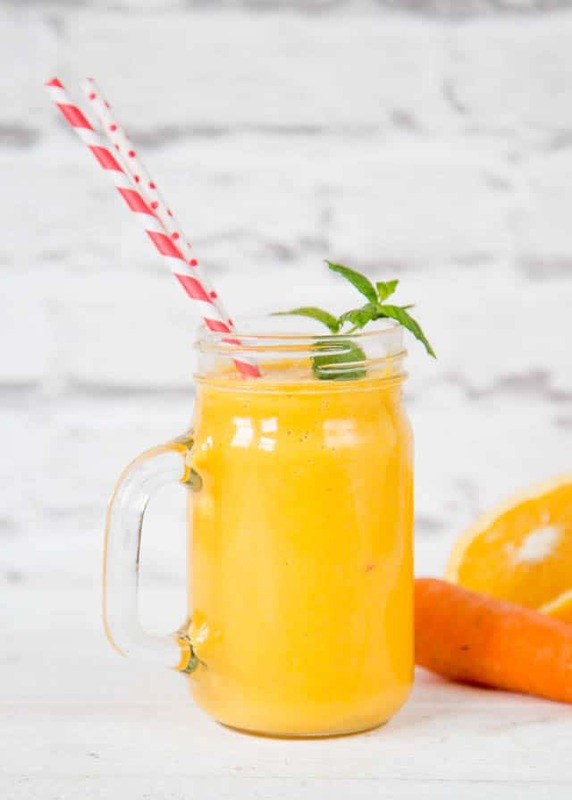 When blending this smoothie I threw in a peeled carrot as well as the peeled orange, it adds colour and texture, with the carrot flavour being almost undetectable. If you are not used to adding vegetables to smoothies then this is good one to start with. I used milk kefir as my liquid base, it is thicker than milk and has a pleasant tartness and is well worth a try if you have not had it before. Otherwise you can substitute a half and half mixture of milk and yoghurt (diary or non diary) or use a non dairy kefir. It’s a powerful pro-biotic. Kefir grains can contain 30 different types of microbe; many more than yoghurt, so kefir is a great way of supporting gut health, particularly for those with digestive problems. Drinking kefir boosts calcium intake, giving stronger bones and helping to prevent osteoporosis. The bacteria in kefir transform the lactose in milk into lactic acid, making it far more palatable to those who are mildly lactose intolerant. Studies have shown that drinking kefir can help those with allergies and asthma, thanks to its anti-inflammatory properties. It’s a great source of protein, phosphorous, vitamins B2 and B12 and calcium. 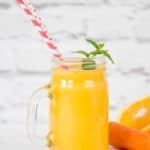 If you try this 4 Ingredient Healthy Orange Creamsicle Smoothie please tag #FussFreeFlavours on Instagram or Twitter. It is amazing for me when for me when you make one of my recipes and I really do love to see them. You can also share it on my Facebook page. Please pin this recipe to Pinterest too! Thanks for reading Fuss Free Flavours! If your oranges have lots of pips then squeeze them and add the juice to the drink. Add a spoon of nut butter for extra protein. I use the Optimum Blender from Froothie for a silky smooth blend every time.